After the weekly security review two days ago, I want to go on with the IoT Weekly Review. Every week I will summarize the most interesting news, articles, blog posts, white-paper etc. with focus on Iot and all the technologies around IoT like: energy, connectivity, cloud solutions, system architectures, fails, wins, harvesting, experiments and many more. Unfortunately not the most actual news and from the first point of view not targeting the IoT domain. But only really first point of view. Du to the fact that most of the IoT devices in he field are battery powered the news sounds more and more interesting. On the international battery seminar at march 2017 Jeff Dahn, a battery researcher from Tesla, announced that the research and development department have found a way how to double the battery life. Besides this very interesting news, they mentioned also that they have developed a battery testing machine which they plan to commercialize. This machine can perform the chemistry tests on batteries more accurate and more detailed. For those who are interested in details, there is a youtube video describing the details. Depending on what your company is focusing on in the IoT domain you probably already had the problem that talking to others from the same Domain but an other focus can be a very hard job. The source of the problem is often that both parties use exactly the same wording, while from the same domain, but talking about the totally different things. Hans de Visser, has written a nice article where he structure the IoT Domain itself in layers but also describe the content of each of the layers in detail. Unfortunately some images and a webpage without lot of information. laurenSlats tweeted, or retweeted a map with a reference to LoRa Alliance and the heading "333,7km! With a helium balloon at 22,6km height (using SF7). Pretty impressive". Having the information above one can derive following scenario. Some guys attached a LoRa node to a helium balloo with some logging firmware installed on the node and let the balloon fly, collecting information about the available LoRa network distribution on it's way but showing also the possibilities of the LoRa technologies --> SF7 from 22,6 km LOS is really very impressive. Below you can see the result of the adventure. At the end 137 Gateways were discovered most of the in the Netherlands. Similar approach to the one above had also some guys in Czech Republic. the fact that the route of the balloon can be traced live online let assume me that the node is equipped also with a cellular module. 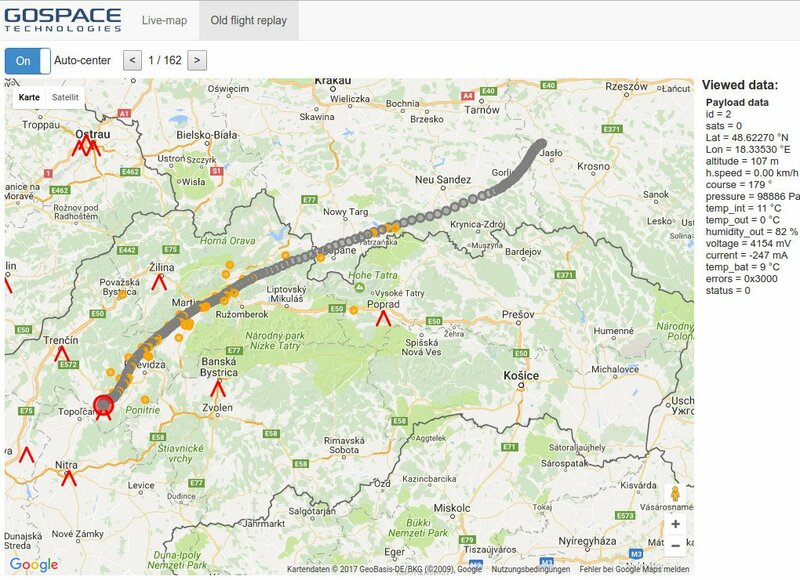 On the website below you can check some previous routes but also see the ballons route live. Beside the Information about LoRa Networks, the Czech guys collected also some environmental informations as well as Informations about the position of cellular stations.